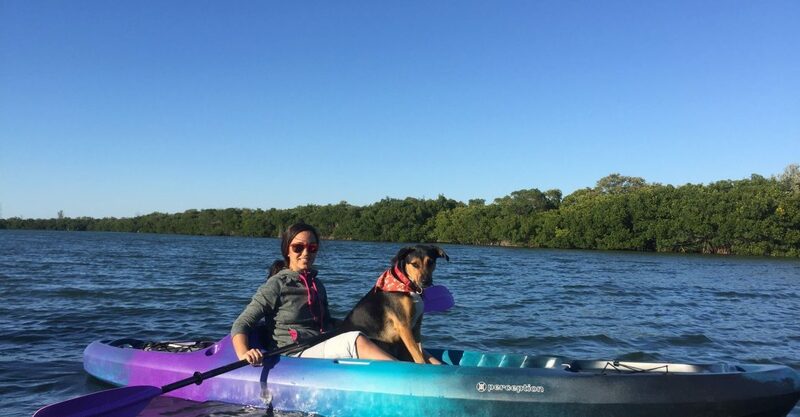 ST. PETERSBURG, FL – Dinorah Chacin Amorena, a PhD student at the Fish Ecology Lab gives you a sneak peak into her personal life. First things first, I love traveling and I love exploring so whenever I have the time I try and get away. Whether abroad or local most of the places I like to visit include those that give me the chance to explore nature. Being outdoors makes me recharge and be in a great mood. I appreciate visiting all sorts of landscapes including endless farm fields, mountains and waterfalls, beaches, dry forests, you name it. I find them all strikingly unique. Another aspect of traveling that I value is that it gives you a chance to get to know other cultures and develop a bond with them. Diversity is what makes this world a truly beautiful one. One activity I love to do during my free time is to spend time our dog Lilo Loca. My husband and I always take her everywhere for little adventures. For example, we take her running, biking, skating, kayaking, and we even dance salsa with her (see picture below). Lilo is the best dog, she really is a great companion and she is always there to cheer me up and remind me that taking time to play is important. I also enjoy spending time catching up with family and hanging out and being silly with my friends. I definitely appreciate good conversations over a glass of wine or two 😉 and strangely in the recent years I have developed a liking for gardening. While I am not very good at it yet! (some plants have died in the process) it helps me relax, connect with nature, and appreciate our little casa (home). If you want to know more about the adventures I like to go in with a sciency spark to it.